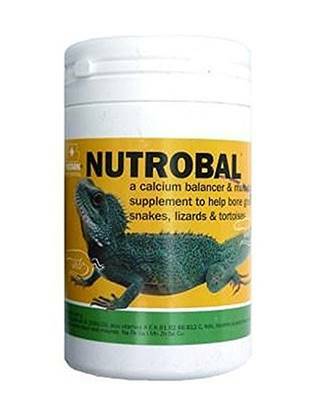 Nutabol is a veterinary developed vitamin / mineral supplement specifically formulated as a high calcium "balancer " for insectivorous reptiles and birds, to assist in correcting the inadequate levels of calcium present in live insectivorous foods such as crickets and mealworms. Contents per gram: 200mg calcium and 150IU D3 plus vitamins A E K B1 B2 B6 B12 C, folic acid, nicotinic & pantothenic acids, biotin choline inositol niacin and minerals Na Fe Co I Mn Zn Se Cu. Available in: 50g and 100g tubs.